The INLIFE i7 robot vacuum cleaner offers powerful suction and self-charging technology in a small and efficient package. This model provides drop-sensing technology, industry-leading A++ energy efficiency, and time-scheduling features to ensure easy operation. The INLIFE i7 features a HEPA-style filter, auto-recharge capabilities, and easy one button press operation. 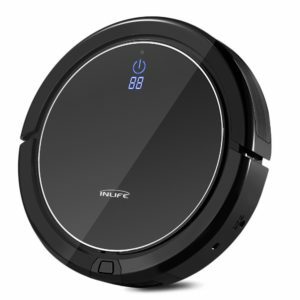 This robot vacuum comes with strong suction power, with its 1000Pa motor taking three hours to charge fully and lasting for 80 minutes on a full charge. You can control the battery life to some degree by scheduling up to 7 cleaning programs each week, with the vacuum returning home and automatically recharging when the power runs low. The INLIFE i7 robot vacuum cleaner is both powerful and intelligent, with its strong 1000Pa motor and HEPA-style filter working alongside advanced scheduling features. Time scheduling can be set on the dock station for easy convenience, with the robot able to clean your home at any time whether you’re home or not. A number of smart sensors are also included to help the robot avoid accidents, both to itself and your furniture. This model works on both hard floor and low-pile carpet surfaces. The INLIFE i7 weighs just 2.2kg, making it one of the most lightweight robotic vacuum cleaners on the market. The product dimensions of this model are 32.3 x 32.3 x 8.4cm, with the INLIFE i7 available in standard black. Along with the unit itself, you also get access to a remote control, charging dock, four side brushes, and one HEPA filter. This model is just 3.6 inches tall and has been specifically designed to fit under most furniture.